After years of just chalking up those leftover nickels and dimes on your MetroCard to the frustrating game of getting around in NYC, the MTA has finally made it super easy to purchase a pay-as-you-go fare card that will ultimately result in a zero balance. 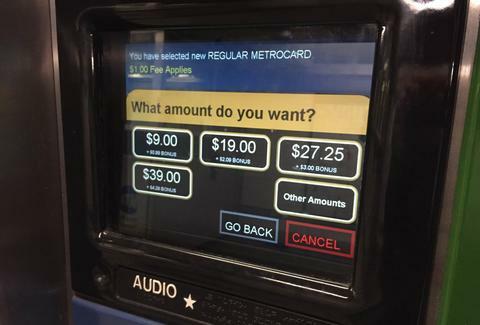 Just as the new fare increases took effect on Sunday, the MTA added a new button to MetroCard kiosks to purchase a $27.25 fare card, which, thanks to the new 11% bonus, will add up to $30.25, or exactly 11 rides and no leftover balance. Now you won't have to do any math yourself or memorize those "magic numbers" that will result in a zero balance -- it's just a default option along with $9, $19, $39, and custom amounts. In comparison, a weekly unlimited ride fare now costs $31. The new button is the second major act of benevolence we've seen from the MTA surrounding the new fare increases, coming just days after the transit agency unveiled a new MetroCard Calculator, which allows you to plug in how much you want to add to your MetroCard and suggests amounts that, along with getting the most of the new bonus, will end up with an exact amount of rides and no change. Local open data analysis blog, I Quant NY, has long advocated for the MTA to make such changes, and claimed victory in a post on Tuesday, detailing the new button. However, the blog calls on the MTA to take additional steps to make purchasing the appropriate fare clearer and easier, such as displaying exactly how many rides you'd get out of the existing pre-determined amount options, the ability to purchase fare cards based on the number of rides you would like to take, and to lift the restriction mandating fare amounts to be divisible by 5 cents so that there are more total amounts that will result in zero balances. Yes, yes, and hell yes! Tony Merevick is Cities News Editor at Thrillist and wishes this was available a long time ago. Send news tips to him at tony@thrillist.com and follow him Twitter @tonymerevick.